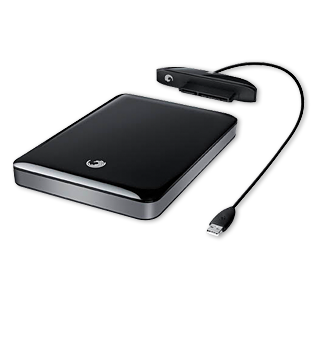 Seagate FreeAgent GoFlex : is of 1 TB (Tera Bytes) capacity with USB 2.0 as interface. The dimensions of the drive are 158 mm in height, 124 mm in width, 44 mm in length, its weight is 1080 g and 3.5 inches of form factor. The drive comes in both vertical and horizontal orientation. The drive also provides dashboard management tool which allows you to easily manage backup schedules, file encryption and can view drive statistics. The USB 2.0 desktop adapter comes with capacity gauge display, the interface can be upgraded to USB 3.0 using desktop adapters. 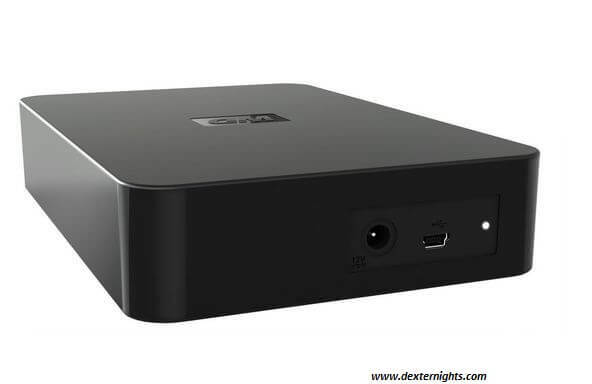 Its compatibility varies depending on the OS and hardware configuration, it works on both Windows and Mac OS platforms like Windows 7, Windows Vista, Windows XP, Mac OS X and etc., the drive is also available in 2 TB and 3 TB capacities. The price of the harddrive is $89. WD Elements External Hard drive : is of 1TB(Tera Bytes), USB 2.0 with data transfer rate of 480 Mbps. Its dimensions are 1.42 inches in height, 7.01 inches in depth, 4.59 inches in width, 1.02 kg in weight. The hard drive comes with Quick installation guide therefore easy to install and store all the data from your pc to the external drive, AC adapter for external power supply to the hard drive, USB cable for connecting to your computer. Its operating temperature is 5 degrees C to 35 degrees C and non-operating temperature of -20 degree C to 65 degree C and it dissipates less heat than other hard drive during data transfer. 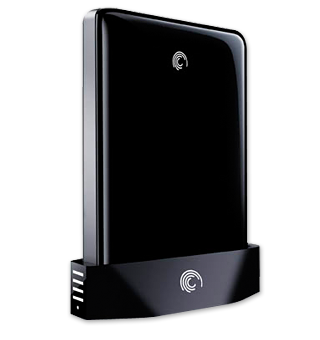 The hard disk is compatible with Formatted NFTS for Windows XP, Windows Vista, Windows 7, Mac OS X, and etc., It is noiseless and has a LED light placed at the rear side of the box. 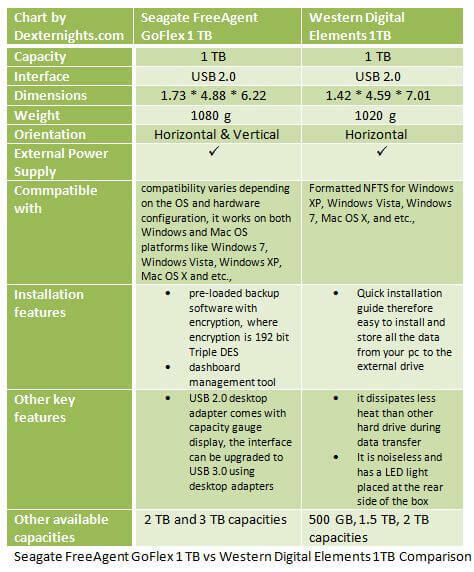 There are also other capacities available like 500 GB, 1.5 TB, 2 TB and etc. The price of the harddrive is $79. Seagate has announced a new innovative portal flexible external hard drives which consists of replaceble end piece easily portable with another interface.Seagate has many variety of products like GoFlex Ultraportable drive , GoFlex Pro UltraPortable drive and GoFlex External Drive.Ultra portable drive also supports ultra upgradable option where in its easy to upgrade from USB 2.0 connectivity to USB 3.0 or FireWire 800 or eSATA.Another feature is it allows you to access content by connecting to TV and also with other networks. So how the disk is going to support all these connectivity and Storage? External harddisk also comes with different dimensions.One is with 2.5 inch and other is with 3.5 inch.GoFlex ProUltra hard drive includes a fast 7200 RPM internal drive, which delivers up to 40% faster file transfer speeds than the standard GoFlex drives when paired with a GoFlex upgrade cable.